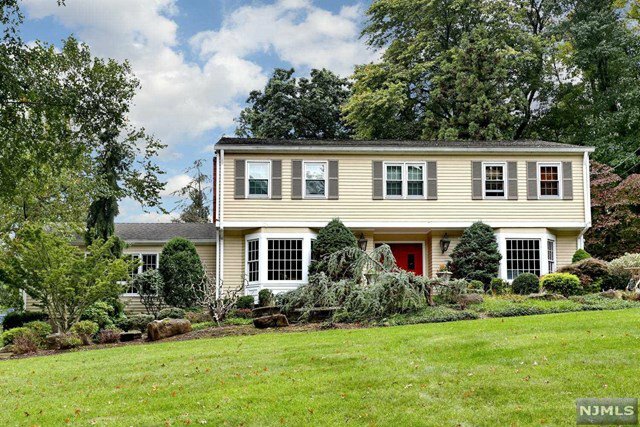 Paver driveway & walkway leads to this classic & spacious colonial set on quiet cul-de-sac! Enter thru the generous foyer flanked by large LR w/French door to yard on one side & Formal DR on the other, both w/warm hardwood floors & plenty of light. Glorious sun floods thru the large windows in the breakfast area & kitchen w/SS applcs, granite counter-tops & bkft bar making entertaining a breeze! Relax in the adjacent family room w/brick fplc & French doors to deck. Guests can enjoy privacy in the 1st floor BR w/adjacent full bath. 2nd floor large Master BR w/French doors opens to master bath w/jetted tub & separate shower/toilet room. 3 addl BRs & newer full hall bath complete the 2nd floor. Plenty of extra finished space in the basement for gym or play area & lots of storage. Step out back & enjoy the sounds of nature in this magnificent yard w/wrap around deck, mature landscaping & Koi pond. Generator,new furnace,new water softener,central vac are just some of the perks!